The guys also have a movie coming out soon called The Scenesters. You can watch the trailer here. Don't bother waiting for the green light here. 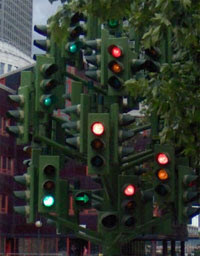 This confusing mess of traffic lights is actually a sculpture by Pierre Vivant in Canary Wharf, London. "The Sculpture imitates the natural landscape of the adjacent London Plane Trees, while the changing pattern of the lights reveals and reflect the never ending rhythm of the surrounding domestic, financial and commercial activities." Sightwalk have some nice interactive panoramic images of the Rheinpark in Cologne. They are using Open Street Maps to show the location of the images. Like Street View it is possible to navigate from one image to the next via arrow links embedded directly in the panoramas. Hopefully this will spur Google to release Street View in Germany soon. The Heavy Backpack website have produced an alphabet of letter shaped images found in Google Maps satellite images. All the images were found within the state of Victoria, Australia. If you like this kind of thing then you will love GeoGreeting.com. GeoGreeting lets you send a message to a friend using letters found on Google Maps. Alternatively, you could try MapMSG. MapMSG lets you send a smoke signal message on Google Maps!